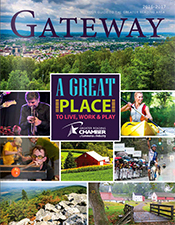 2016 HR Summit Presentations available here. 2106 Energy Forum Presentations available here. 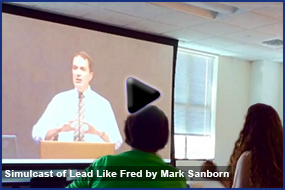 Chamber Members learned how to Lead Like Fred at a recent simulcast by Mark Sanborn, best-selling author of the series Fred Factor and Fred 2.0. Held at National Penn Bank Headquarters, participants were reminded to remember the small things, and to note that everyone makes a difference! 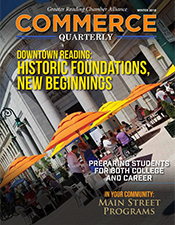 Listen to two National Penn Bank employees share their reactions to the simulcast here. 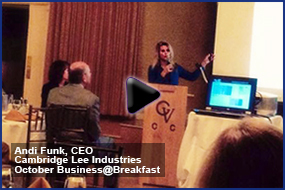 Andi Funk, CEO, Cambridge Lee Industries, discusses the importance of a skilled, prepared, and eager workforce at the Chamber's October Business@Breakfast. 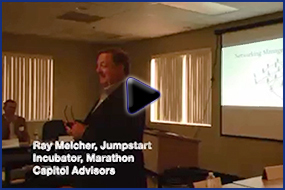 SIPS (Summer Information Programs) presenter Ray Melcher discussed networking on Tuesday, August 19th, with a large group at our Center for Business Excellence. Watch this video to hear his biggest pet peeve at networking events!